A Near-Real Time (NRT) Wind speed as soon as Level-1 data becomes available from the NASA Snow and Ice Data Center (NSIDC). The NRT wind processing uses ancillary fields of shorter latency but lower quality (i.e., salinity, SST, and atmospheric profiles from forecast models). The most important is the salinity forecast field from the HYCOM model. A Final Wind Speed version, reprocessed with a 1-month delay, which uses higher quality ancillary data. 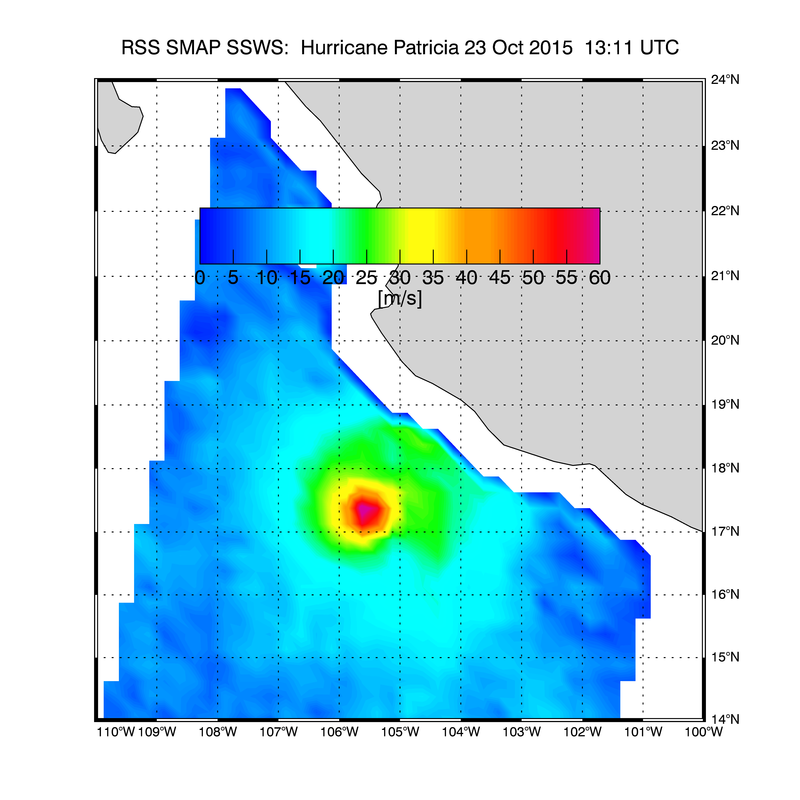 The most important is the 8-day SMAP salinity processed at Remote Sensing Systems. Additionally, we now provide Tropical Cyclones (TC) ASCII files with SMAP 10-min maximum-sustained winds (in kn) and wind radii (in nm) for the 34 kn (17 m/s), 50 kn (25 m/s), and 64 kn (33 m/s) winds for each SMAP pass over a TC in all tropical ocean basins. Images for these TC fixes are also provided as jpeg files (below is a sample image for Hurricane Irma). The TC fixes are written in a format easy to ingest for TC forecasts, as used in the Automated Tropical Cyclone Forecasting (ATCF) systems at the US Navy. Each data file consists of two 0.25° gridded daily maps of wind speeds, one containing ascending (18:00 local equatorial crossing time) orbit segments and the other containing descending (06:00 local equatorial crossing) orbit segments. Each data file contains only those observations for which the UTC observation time falls within that UTC day. The time of the observation is recorded as minute-of-day in the files. We do not average the observations from different orbit segments. If observations from different orbits fall within the same grid cell, the observation from the latest orbit is used and all other observations are overwritten. If a grid cells contains observations from both the forward look and the aft look of the same orbit, then the forward and aft observations are averaged together as these have occurred very close in time (typically within 2 minutes). We do not use observations for which the gain-weighted land or sea fractions in the antenna field of view exceed 0.007. A sea-ice climatology is used to mask observations close to the sea ice edge. The wind speeds are at 10-meter height above the sea surface and are considered an equivalent neutral winds. The center of the 1st cell of column 1440 and row 720 in the map is at 0.125 E longitude and at 89.875 S latitude. The center of the 2nd cell is at 0.375 E longitude and at 89.875 S latitude. Latitude and longitude variables are included in the NetCDF files. Missing data exist within a file. There are gaps between orbit segments. There are also gaps caused by data from NASA being unavailable due to instrument issues. Invalid data values in the wind speed and minute maps are set to -9999. In any given map, missing values also occur in areas that have been masked because they are too close to the coast or the sea ice edge. In the NRT product areas of large salinity variability near river plumes are also masked and therefore missing. Details are discussed below under “Known Reduced-Quality Issues in the NRT product”. Very rarely, the wind retrieval algorithm converges poorly, which also results in missing data. Large data gaps other than those between orbits are generally due to missing data upstream from our processing facility, such as the instrument being turned off or data files not provided to us. Occasionally, there are delays in obtaining and/or processing data; however, beyond several weeks, it is unlikely that missing data will become available. For information on current outages, please check the RSS web page announcements. Each daily wind speed is plotted for user examination in our image browse environment. The scale for each browse image is located below the map for reference. To access the images, click the link on the upper left. When visually browsing the wind speed imagery, the navigation may skip dates with no data, or you may see a blank map stating that no data are available for that time. If this occurs and you are sure there should be data for that date, please contact RSS Support. NetCDF data files for dates with completely missing data are not produced and will be absent from our FTP server. An IDL sample code to read the data is provided in the read routine ftp folder Any other tool/software capable of reading NetCDF files can be used, such as Panoply. 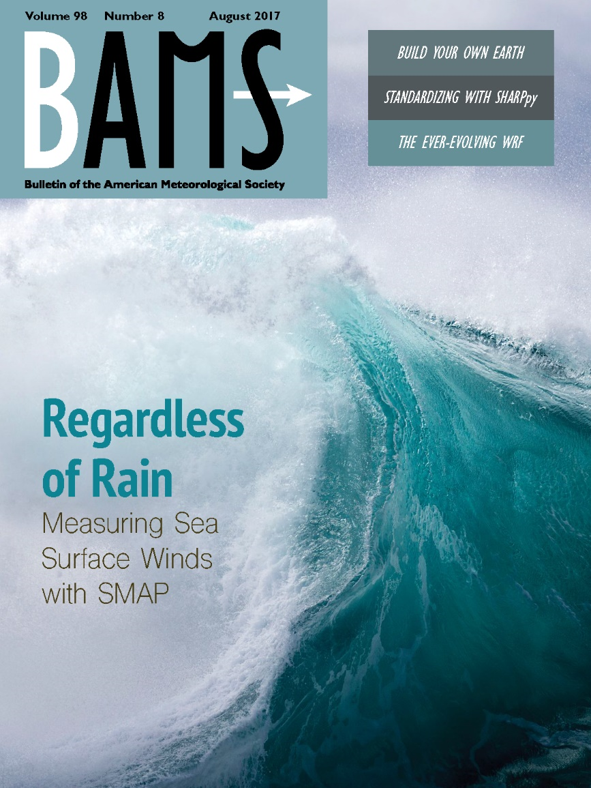 The SMAP V1.0 sea surface wind retrievals are based on the Geophysical Model Function (GMF) for the wind-induced emissivity that has been derived for the Aquarius Version 5 salinity retrievals [Meissner et al., 2017b]. The key part in this GMF is the model function for the wind induced emissivity [Meissner et al., 2017a]. It has been derived from match-ups between Aquarius TB and collocated WindSat wind speeds [Meissner et al., 2014]. Above 17 m/s the wind induced emissivity model function for both vertical (V-pol) and horizontal (H-pol) polarization grows linearly with wind speed. The GMF for the wind emissivity in V1.0 differs slightly from the one that had been used in the BETA release. The V1.0 wind induced GMF has a small dependence on sea surface temperature. This SST dependence was neglected in the BETA version. Based on Aquarius observations, the rise of the V1.0 wind induced GMF at high wind speeds is slightly larger in cold water than in warm water. As a consequence, high wind speeds in extratropical cyclones over cold water are reduced by about 6% in V1.0 compared to the BETA release. That brings them into better agreement with WindSat wind speeds [Wentz et al., 2013] if there is no rain. The wind speeds of tropical cyclones, which occur over warm water, have changed very little in SMAP 1.0 compared to the BETA release. The wind speed retrieval algorithm requires ancillary input data for sea surface salinity and sea surface temperature in order to compute the brightness temperature of a flat ocean surface [Meissner and Wentz, 2004; 2012]. This computed brightness temperature is then subtracted from the measured surface brightness temperature, and the difference is matched to the GMF for the wind-induced emissivity using a Maximum Likelihood Estimator (MLE). We use both vertical and horizontal polarizations in the sea surface wind speed retrievals. 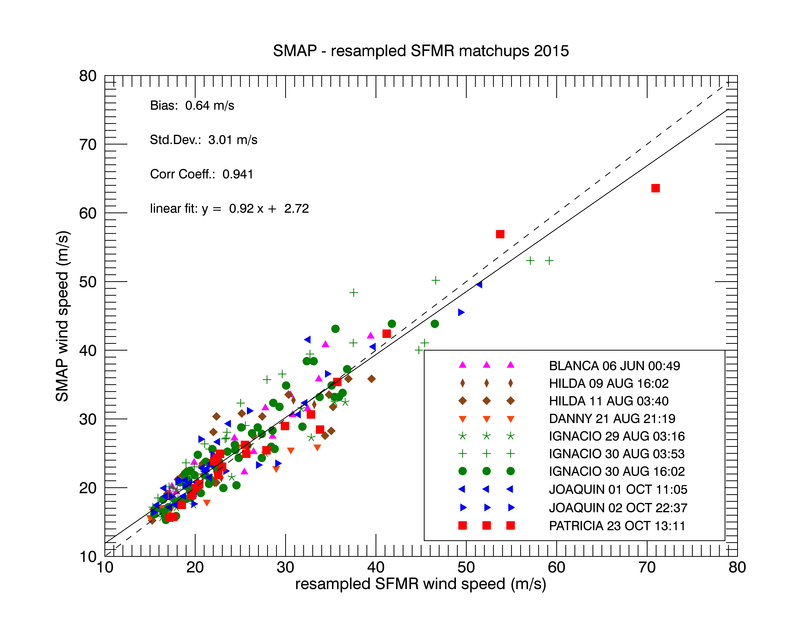 We have completed an evaluation of the performance of the SMAP retrieved wind speeds by comparing them with wind speeds from the collocated WindSat winds. This comparison shows a global RMS of about 1.3 m/s for the SMAP – WindSat wind speed difference when the SMAP for and aft observations in one Earth cell are averaged together. This means that the global accuracy of the SMAP wind speeds matches approximately that of most numerical weather prediction models, such as from NCEP or ECMWF, but that the performance is not as good as that for most other active and passive microwave satellite sensors (SSMI, TMI, GMI, WindSat, AMSR, QuikSCAT, ASCAT, RapidScat), which typically have a RMS of 1.0 m/s or better. The big strength of the SMAP winds lies in the retrieval of high wind speeds and thus winds in storms. The capability of L-band radiometers to measure winds in storms has been demonstrated by the SMOS mission [Reul et al., 2012]. 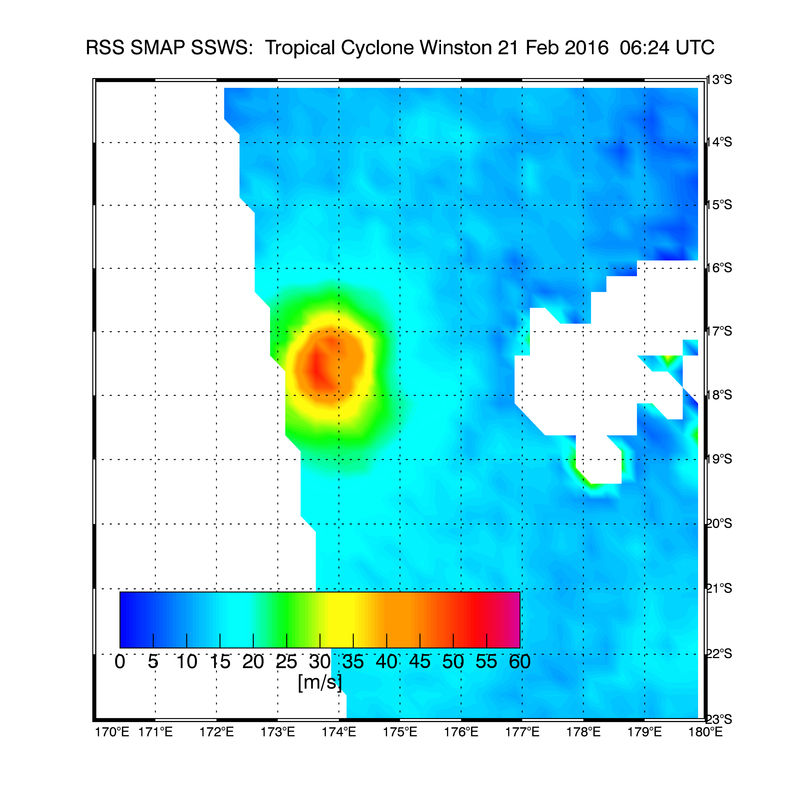 The SMAP wind induced emissivity signal grows approximately linearly between 18 and 70 m/s and thus maintains measurement sensitivity over a wide range of wind speeds. In addition, SMAP sea surface wind retrievals are little or not affected by rain [Meissner et al., 2017]. 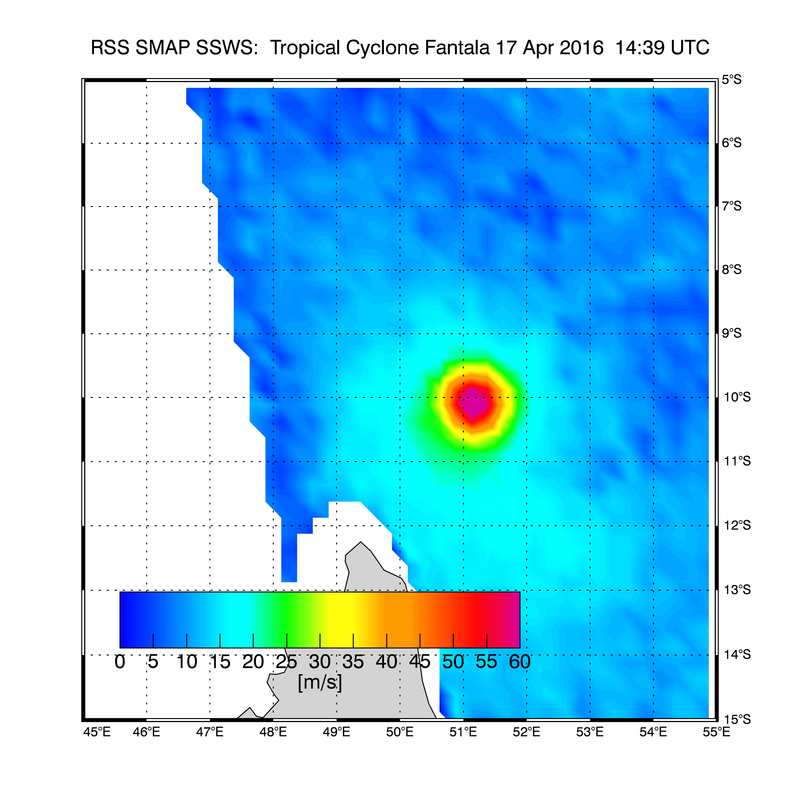 SMAP has a distinct advantage over many other active (ASCAT, QuikSCAT, RapidScat) and passive (SSMI, TMI, GMI, WindSat, AMSR) satellite sensors, whose wind-induced signals either saturate in very high winds or degrade in the presence of rain. We have validated the SMAP winds in storms by collocating SMAP winds with those from the Stepped Frequency Microwave Radiometer SFMR [Uhlhorn et al., 2007; Black and Uhlhorn, 2014] for 20 tropical cyclones in 2015 and 2016 (in the figure below). The agreement between these two instruments for winds greater than 25 m/s is very good, with a bias of 0.5 m/s and a standard deviation of ~3 m/s. Validation studies are described in detail in [Meissner et al., 2017a]. Freshwater outflows from large rivers (Amazon, Congo, Ganges, Mississippi, Rio de la Plato, ...). ARGO drifters cannot get close to the shelf. Therefore, the salinity values from the HYCOM model, which is used in the NRT processing, can be inaccurate, because of the lack of input data. 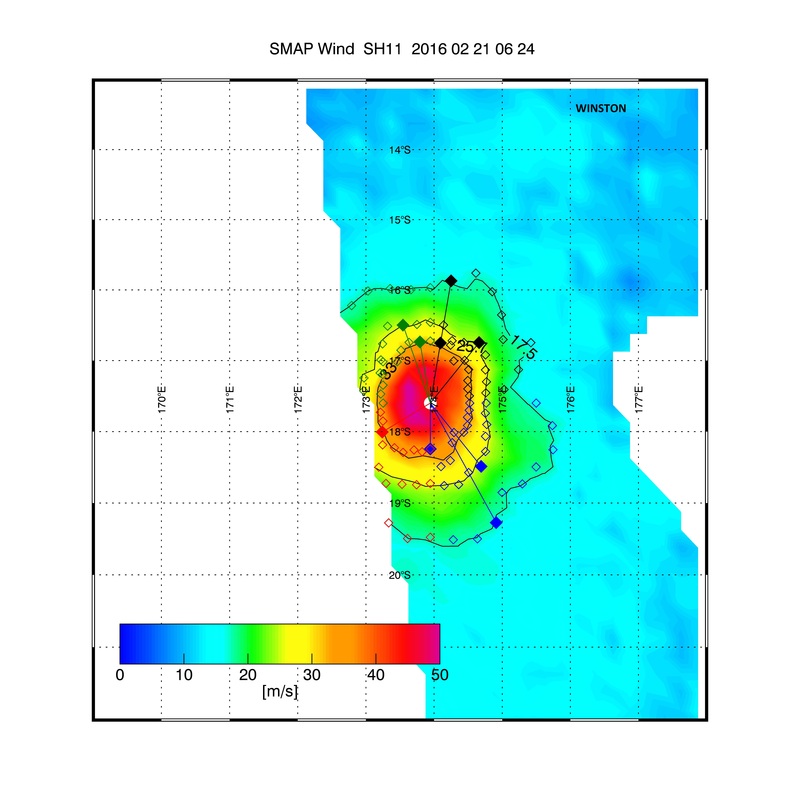 SMAP wind speed retrievals in those areas can have spurious biases and should be used with great care. In V1.0 most of these regions have been masked. Observations from locations with a large natural variability in salinity are discarded. 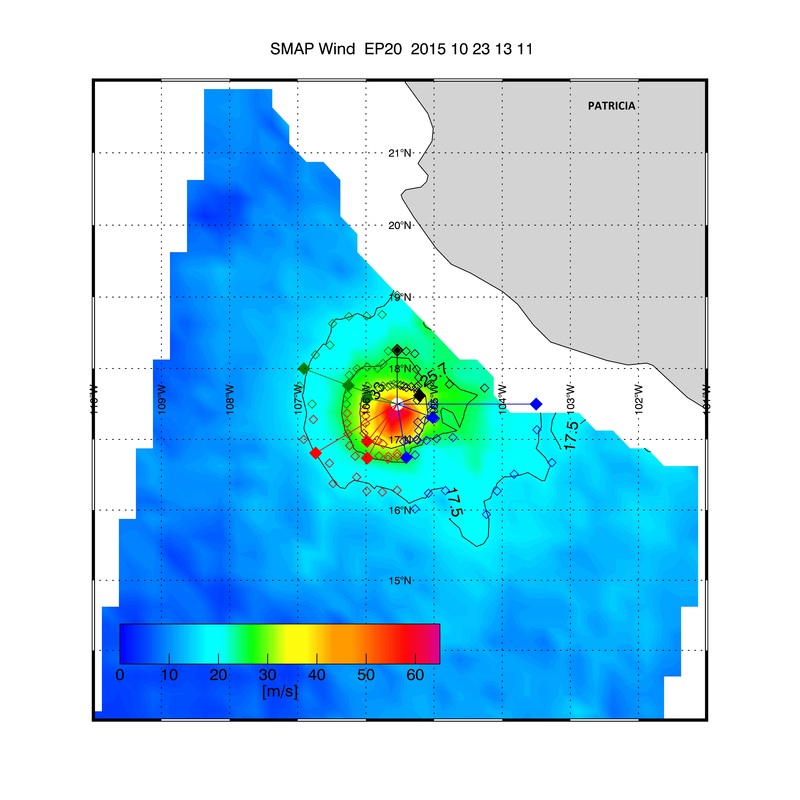 These issues are resolved in the Final version of SMAP winds by using a higher quality ancillary field from salinity retrievals from SMAP itself, which are not available at the time of the NRT processing. Freshening by heavy rain in low winds can cause stratification within the upper ocean layer. The ARGO drifters measure salinity at 5-meter depth and therefore the HYCOM model, which is based on ARGO, can be too salty compared with the SMAP measurement. The rain freshening effect is not a problem when measuring winds in storms, because at high wind speeds the upper ocean layer is well mixed [Boutin et al., 2015]. 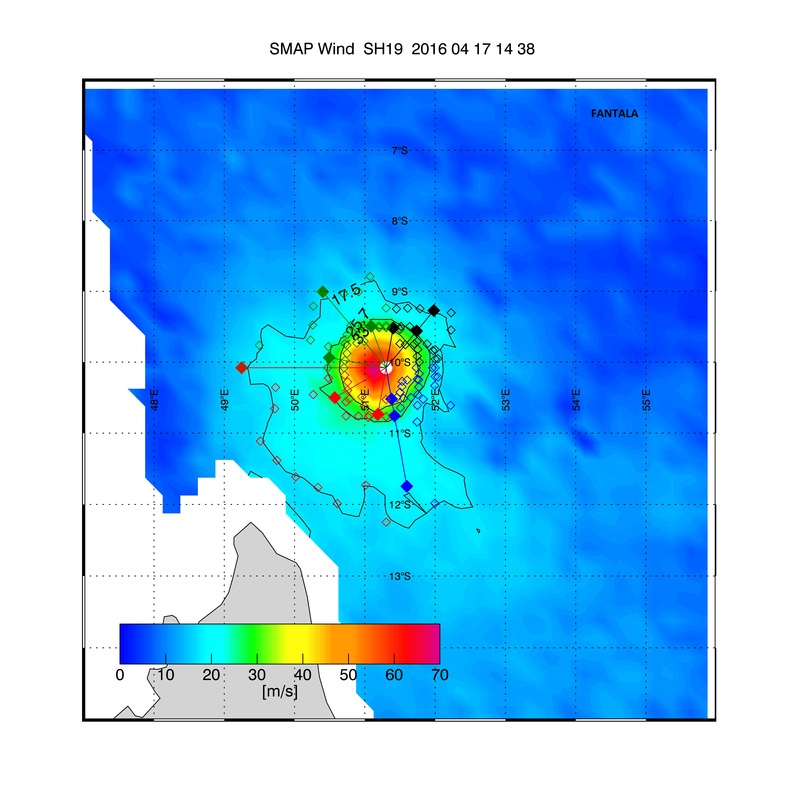 "SMAP sea surface wind data are produced by Remote Sensing Systems and sponsored by NASA Earth Science funding. 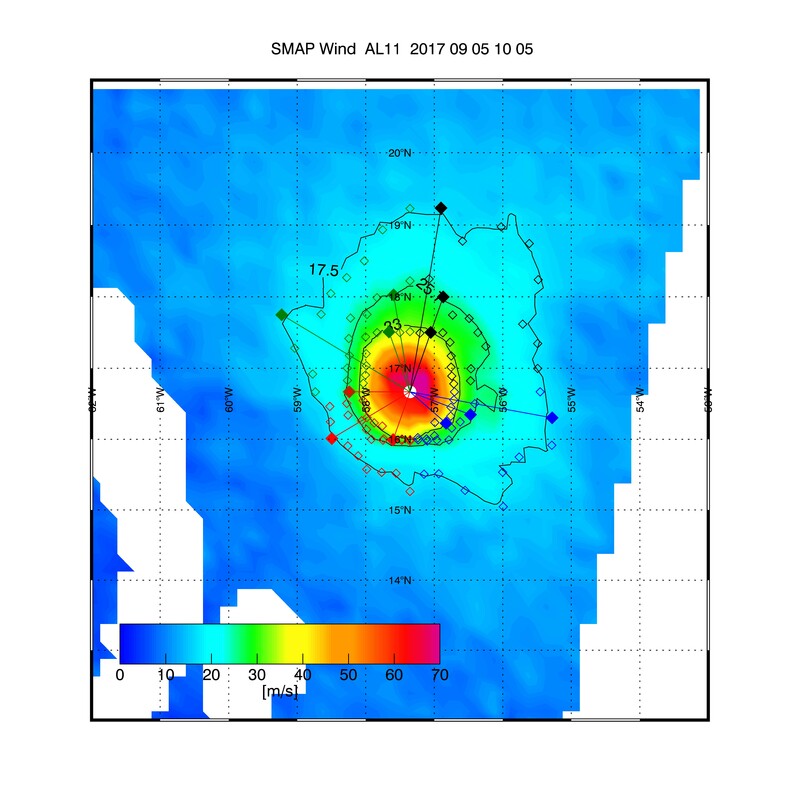 Data are available at www.remss.com/missions/SMAP/winds/"
An official data citation for use in journal publication reference section is given above. Select or insert the appropriate information in brackets. Boutin, J., Y. Chao, W. Asher, T. Delcroix, R. Drucker, K. Drushka, N. Kolodziejczyk, T. Lee, N. Reul, G. Reverdin, J. Schanze, A. Soloviev, L. Yu, J. Anderson, L. Brucker, E. Dinnat, A. Santos-Garcia, W. Jones, C. Maes, T. Meissner, W. Tang, N. Vinogradova, and B. Ward, 2016, Satellite and In Situ Salinity: Understanding Near-Surface Stratification and Subfootprint Variability. Bull. Amer. Meteor. Soc., 97, 1391–1407, doi: 10.1175/BAMS-D-15-00032.1. Klotz, B., and E. Uhlhorn, 2014: Improved Stepped Frequency Microwave Radiometer Tropical Cyclone Surface Winds in Heavy Precipitation, Journal of Atmospheric and Oceanic Technology, 31, 2392 – 2408, doi: 10.1175/JTECH-D-14-00028.1. Meissner, T., and F. Wentz, 2004: The complex dielectric constant of pure and sea water from microwave satellite observations, IEEE Transactions on Geoscience and Remote Sensing,42(9), 1836 -1849. Meissner, T., and F. Wentz, 2006: Ocean Retrievals for WindSat: Radiative transfer model, algorithm, validation, talk given at the 9th Specialist Meeting on Microwave Radiometry and Remote Sensing Applications, San Juan, Puerto Rico, USA, IEEE Catalog no. 06EX1174C, doi: 10.1109/MICRAD.2006.1677074. Meissner, T., and F. Wentz, 2012: The emissivity of the ocean surface between 6 - 90 GHz over a large range of wind speeds and Earth incidence angles, IEEE Transactions on Geoscience and Remote Sensing, 50(8), 3004 – 3026. Meissner, T., F. Wentz, and L. Ricciardulli, 2014: The emission and scattering of L-band microwave radiation from rough ocean surfaces and wind speed measurements from the Aquarius sensor, Journal of Geophysical Research, 119, doi: 10.1002/2014JC009837. Meissner, T., F. Wentz, and D. Levine, 2017b, Aquarius Salinity Retrieval Algorithm, ATBD, End of Mission Version and Addendum V, RSS Technical Report 120117, 2017, available online at ftp://podaac-ftp.jpl.nasa.gov/allData/aquarius/docs/v5/AQ-014-PS-0017_AquariusATBD_Level2_ EndofMission_DatasetVersion5.0.pdf. Poe, G. A., 1990: Optimum interpolation of imaging microwave radiometer data, IEEE Transactions on Geoscience and Remote Sensing, 28(5), 800–810. Piepmeier, J. R., P. Mohammed, J. Peng, E. J. Kim, G. De Amici, and C. Ruf. 2016. SMAP L1B Radiometer Half-Orbit Time-Ordered Brightness Temperatures, Version 3. [RFI-filtered antenna temperatures]. Boulder, Colorado USA. NASA National Snow and Ice Data Center Distributed Active Archive Center. doi: http://dx.doi.org/10.5067/YV5VOWY5V446. Reul, N., J. Tenerelli, B. Chapron, D. Vandemark, Y. Quilfen, and Y. Kerr, 2012: SMOS satellite L-band radiometer: A new capability for ocean surface remote sensing in hurricanes, Journal of Geophysical Research, 117, C02006, doi: 10.1029/2011JC007474. Uhlhorn, E., J. Franklin, M. Goodberlet, J. Carswell, and A. Goldstein, 2007: Hurricane surface wind measurements from an operational stepped frequency microwave radiometer, Monthly Weather Review, 135(9), 3070 – 3085, doi: http://dx.doi.org/10.1175/MWR3454.1. Wentz, F.J., L.Ricciardulli, C.Gentemann, T. Meissner, K.A. Hilburn, J. Scott, 2013: Remote Sensing Systems Coriolis WindSat [indicate whether you used Daily, 3-Day, Weekly, or Monthly] Environmental Suite on 0.25 deg grid, Version 7.0.1, [indicate subset if used]. Remote Sensing Systems, Santa Rosa, CA. Available online at www.remss.com/missions/windsat. [Accessed dd mmm yyyy].